Statewide over 70 percent of all Minnesota public high school graduates attend a postsecondary institution either in Minnesota or elsewhere within the first two years of high school graduation. 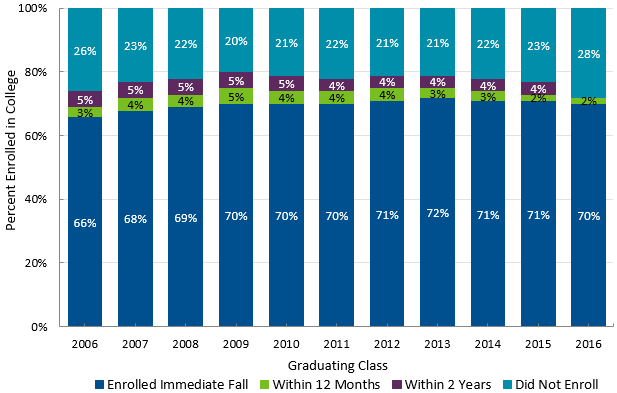 Immediate college enrollment has increased nearly 10 percent over the past decade. What data is available on my high school graduates? Minnesota high school and district staff often wonder what happens to graduates of their school. They wonder how many of their graduates enroll in college, where they attend, along with questions on other college outcomes. The number and percent of high school graduates enrolling in a postsecondary institution. The types of colleges attended: public or private and two-year or four-year. The number and percent of high school graduates persisting at postsecondary institutions. The number and percent of high school graduates completing an associate or bachelor's degree. A list of the most frequently attended postsecondary institutions. Where do I find data for my high school? Download data reports from each high school at the bottom of this page. Or, search online. The Minnesota Statewide Longitudinal Education Data System (SLEDS) website provides profiles of individual graduating classes for each high school. Data on where Minnesota public high school students enroll in college are reported by the National Student Clearinghouse using the StudentTracker for High Schools program. Data on Minnesota public high school graduates was provided to the Clearinghouse from the Minnesota Statewide Longitudinal Education Data System (SLEDS). Ninety-six percent of postsecondary institutions in the United States and 98 percent of Minnesota postsecondary institutions participate in the National Student Clearinghouse. Caution should be used in interpreting this data. Approximately 5 percent of students do not have a high school code associated with their college enrollment record and therefore are not included in the reports below. The data originates with the Statewide Longitudinal Education Data System and is matched with the National Student Clearinghouse data system using a probabilistic matching algorithm. Probabilistic matching uses a range of potential identifiers and weights to calculate the probability that two given records refer to the same individual. Learn more about SLEDS and college-going data: Presentation at the Minnesota Association of Secondary Schools Principals Conference, June 2013. Questions or data errors in these reports? These reports highlight trends in college-going by Minnesota public high school graduates. Schools with fewer than 25 graduates in a single graduating class are not included here, but are available to school officials upon request. Important: To download one of the zipped files below, right click on the link and select Save target as... to save the file to your machine.